Carbonite Cloud Migration Powered by DoubleTake is an online service that enables migrations from any physical, virtual or cloud-based environment into VMware vSphere, vCloud Director, OpenStack, Amazon Web Services EC2 or Microsoft Azure infrastructure as a service (IaaS) cloud environments. The webbased console provides automated, centralized migration to the cloud. 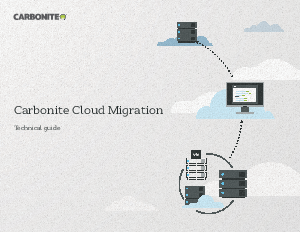 This document provides a detailed technical briefing on the functionality and use of Carbonite Cloud Migration and assumes that the reader will have at least a basic understanding of infrastructure as a service (IaaS).